Jim Collins was one of fifteen experts who addressed this audience of architects; contractors; building owners; preservationists and planners who earned up to ten AIA Continuing Education Credits in two days of education and networking. Material suppliers were in the education mix too, providing technical information about the performance of traditional products from windows to hardware, ornamental metals to decorative paint, clay tile to storm panels. “A Master Class on Craft, Form and Function,” led by craftsman Brent Hull of Hull Historical focused on doors: the history of their construction, durability per their climate; installation techniques and maintenance information. This session was followed by “Historic Window Rehabilitation,” by Chick McBrien CSI CDT of Marvin Windows who extols “repair first,” when approaching historic tax credit projects. Three different important institutional project restorations were presented in three additional seminars, each providing case study, how-to advice for major restoration work: The Maryland State Senate Chamber of the Maryland State House in Annapolis; The U.S. Capitol Dome restoration and the National Cathedral restorations in Washington D.C. The Christman Company’s Tom Whitmore and David Overholt walked the audience through a series of events which took place in 1783-84. As the temporary home of the Continental Congress, General George Washington resigned his commission here, thus creating the first modern democracy, in this Maryland State House Senate Chamber. Restoration of this space returns it to its appearance from December 23, 1783. 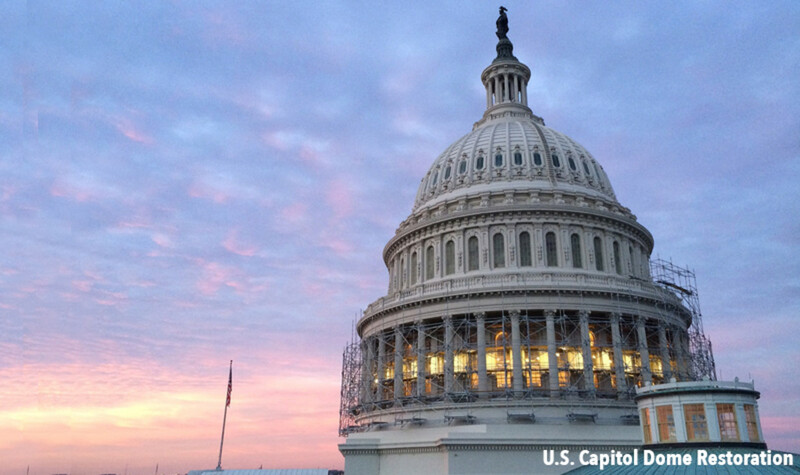 Christine Merdon, Chief Operating Officer of the Architect of the Capitol and Robert Baird, President of Historical Arts and Casting Inc. described the restoration of the U.S. Capitol Dome, a major cast iron repair project high up on a scaffold. James Shepherd, Director of Facilities and Preservation at The National Cathedral discussed the $34 billion earthquake repair and restoration project at this national landmark. Stabilization for future seismic events has been Shepherd’s restoration priority as well as fixing broken stone, ornament and stain glass. Lessons learned from these historic institutional projects were not only interesting but also applicable. Methods for preservation and materials for durability were examined closely.